I am an artist, and I like artists. I like artists because they are pretty brave. Brave to be pouring their heart and soul out onto a canvas, a piece of paper, wood panel, wall, or even a ceiling. Artists seize a chunk of clay and shape a piece of themselves permanently into a new form. They write themselves into new worlds and record observations from their perspective through photography. We are brave when it comes to creating, but when it comes to marketing our artwork, most of us would rather freefall off a cliff side, than ask people to invest in our works of art. It is the ‘impersonal’ business side of the art world that can be tough, for something that must be personal to be authentic. I get it. Some artist’s, like myself, come to their career with marketing experience, a marketing mentor, or art business experience. Regardless of your background and strengths, there is always learning to be done, and the time spent away from making art is as vital to your success. I chose early on to be an artist that rebels against the common assumption that an artist must starve for their passion. I initially wrote a business plan, and I not only prepared myself to say yes to lady luck, I made my own luck. The most important part of this preparation is research. I have always been curious and willing to throw my hat in the ring, even if the ring was in a Sports Hall of Fame. Through information interviews, coffee talk, travel, and reading, I learned to open doors that I feared opening. When everyone was headed left, I did not turn right, I climbed up and over. What works for one artist will not work for another, you must find your own niche and stick and the ‘stick’ is hard, especially when your work is not selling. Whether it be gallery representation, self-representation or a combination of both, you have to find what works for YOU. I recently reached out to some of my favourite established artists to get their views on the business of art. I asked these artists five questions about marketing their art, and I received so many great answers. Originally I was going to include everyone in this blog post, but there were so many great and in depth answers, I decided to break this piece into two parts. For Part I, my focus is Andrew Valko and Gordon Milne. 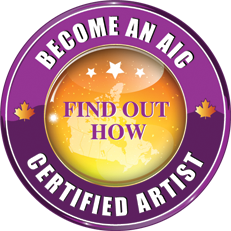 Whether beginning in the advertising industry like Canadian artist Andrew Valko, or beginning with gallery representation and making a switch to self-representation like Gordon Milne, there are many avenues an artist can take to success. Are you represented by a gallery, self-representing, or both? I am represented by Douglas Udell Gallery in Vancouver and Edmonton, and Mayberry Fine Art in Winnipeg and Toronto. What is the single most effective thing you do to sell your work? I try to create an engaging piece of art. This takes creating your personal language, hard work, knowledge, passion, belief, patience, and never compromising. I believe the viewer is drawn to the energy in a good painting whether abstract or representational and ultimately he or she wants to own it. Have you ever written a business plan or keep a list of career goals as an artist? The answer is no. Although I don’t think that is a bad idea. I have studied and have an understanding of the historical and contemporary art world and market. I have also looked at the careers of many artists to gain an understanding of how they reached their career goals. There are many different career paths that an artist can take, I believe it is important to choose the one that is best suited to you and the work you are doing. When the market is slow, have you created another source of income to fall back on? I feel fortunate that at this stage of my career I don’t have to create another source of income. ( Knock on wood ) I originally studied Advertising so when I was younger I subsidized my income for number of years by freelancing in graphic design and illustration. Hypothetically speaking; If Larry Gagosian approached you with an offer to represent your work, market you and sell your work into many collections, most of which stockpile art in a warehouse where it will never be seen again, would you take him up on his offer? Absolutely, Larry Gagosian is one of the biggest dealers in the world, being represented by him would be an incredible endorsement. Unfortunately many works of art sit in museum or private collection warehouses, and are rarely on display. Sadly if they are on display, especially in private collections, they are seen by very few people. Unfortunately we are used to looking at art in print reproductions, or on the internet. At this time, and for close to 40 years, I have not been represented by a gallery. Early in my career I was represented briefly by several galleries and I discovered very quickly that my expectations of gallery representation were vastly different from the reality of the art world. I felt that I was better equipped to personally manage the promotion and marketing of my work and have successfully done that outside the traditional art gallery world. Self-promotion is extremely hard work but, in my case, I’m pleased with the decision I made and, in terms of sales, I have managed to discover far more exciting avenues, creative potential and success than I ever would have experienced dealing solely with a gallery. In my opinion it is essential to develop a comprehensive and diverse mailing list comprised of people who genuinely like what I do…from friends and relatives, corporate interests, museums, collectors and others. This is an ongoing list and has taken many years to compile. I try very hard to keep these people aware of what I’m doing by announcing new work, upcoming exhibits and general information through newsletters, a well-developed website and, to a lesser extent, social media. Not really. I know what I want to paint. The trick is, once I’ve established my artistic direction, to successfully market and exhibit these works. There’s always part time jobs. Hypothetically speaking; If Larry Gagosian approached you with an offer to represent your work, market you, and sell your work into many collections, most of which stockpile art in a warehouse where it will never be seen again, would you take him up on his offer? This is really no different from having artwork purchased by a major museum or an arts organization like the Alberta Foundation for the Arts or Canada Council. A sale is made, it’s nice to say that your work is in a specific collection, but the down side is that your work will be seen only fleetingly, if at all. Personally, I’d rather be commissioned to produce a painting for someone who likes my work and wants to hang it in their home or office…where others can appreciate it as well.